I love to give and receive the gift of books at Christmastime. One particular Christmas, my mother gave me four beautiful new Puffin Classics books. They included the titles ‘Little Women’, ‘What Katy Did’, ‘The Children of the New Forest’ and ‘The Water Babies’. I will always associate the memory of Christmas with these books. Here are some endearing Christmastime scenes, taken from five of my favourite childhood books. Can anyone forget the first New England Christmas that the March girls spend during the American Civil War? They are gathered around the fire, feeling very sorry for themselves, because their mother has said that there will be no gift giving this particular Christmas, when so many people are facing extreme hardship. Each of the sisters is grievously planning what they will do with their own personal funds. Amy means to buy pencils for herself, Beth some sheet music, Jo a new book and Meg yearns for pretty little trifles. Then they observe their beloved Marmee’s worn slippers and it has a sobering effect on them. They resolve to sacrifice their own happiness to buy something for their mother. Do you the remember the Christmas when Matthew insists on puffed sleeves for Anne? One grey December evening Matthew notices a bevy of small girls practicing for a play in Green Gable’s sitting room. As he observes them from a distance he notices that Anne looks different from her friends. After a while he realizes that it is due to the fact that Marilla dresses Anne in very plain, unattractive clothing. Matthew decides that a Christmas present is a good excuse to give Anne a dress with puffed sleeves. He arrives at the store, but he is so embarrassed to enquire about the dress that he walks away with several garden rakes and many pounds of coarse brown sugar instead! In the end, Mrs Lynde helps him, by agreeing to make a dress for Anne and the following scene ensues on Christmas morning at Green Gables. Christmas morning broke on a beautiful white world. It had been a very mild December and people had looked forward to a green Christmas; but just enough snow fell softly in the night to transfigure Avonlea. Anne peeped out from her frosted gable window with delighted eyes. The firs in the Haunted Wood were all feathery and wonderful; the birches and wild cherry trees were outlined in pearl; the plowed fields were stretches of snowy dimples; and there was a crisp tang in the air that was glorious. Anne ran downstairs singing until her voice reechoed through Green Gables. “Merry Christmas, Marilla! Merry Christmas, Matthew! Isn’t it a lovely Christmas? I’m so glad it’s white. Any other kind of Christmas doesn’t seem real, does it? I don’t like green Christmases. They’re not green—they’re just nasty faded browns and grays. What makes people call them green? Why—why—Matthew, is that for me? Oh, Matthew!” Matthew had sheepishly unfolded the dress from its paper swathings and held it out with a deprecatory glance at Marilla, who feigned to be contemptuously filling the teapot, but nevertheless watched the scene out of the corner of her eye with a rather interested air. Anne took the dress and looked at it in reverent silence. Oh, how pretty it was—a lovely soft brown gloria with all the gloss of silk; a skirt with dainty frills and shirrings; a waist elaborately pintucked in the most fashionable way, with a little ruffle of filmy lace at the neck. But the sleeves—they were the crowning glory! Long elbow cuffs, and above them two beautiful puffs divided by rows of shirring and bows of brown-silk ribbon. “That’s a Christmas present for you, Anne,” said Matthew shyly. “Why—why—Anne, don’t you like it? Well now—well now.” For Anne’s eyes had suddenly filled with tears. The two sisters, Katy and Clover Carr, whom we first met in the book, ‘What Katy Did’, have been sent off to boarding school in the book ‘What Katy Did at School’. On Christmas Day, the entire school is snowed in. Only Katy and Clover’s Christmas box magically arrives, laden with Christmas goodies from home. It is a delightful box, holding such wonderful treasures. When I was little, I read and re-read the contents of the box several times. Here is an excerpt that describes part of the contents of the box. …Never was such a wonderful box. It appeared to have no bottom whatever. Under the presents were parcels of figs,prunes, almonds, raisins, candy; under those, apples and pears. There seemed no end to the surprises. The Pevensie children, Peter, Susan and Lucy are on their journey across the Narnian countryside in search of Aslan, after they discover their brother Edmund has betrayed them to the White Witch. They are accompanied by Mr and Mrs Beaver. Narnia is a country, which under the magic of the White Witch is assailed by a constant Winter, but never Christmas. Slowly, the Witch’s magic is broken because Aslan is on the move. Quite unexpectedly, the children come face to face with Father Christmas who bestows them with important gifts. It is moment of great joy and hope for change, that might shape the future of the country. Laura Ingalls Wilder provides the best descriptions of Christmas. These are not the Christmases of extravagant gifts and yuletide excesses. The Christmases are plain, heartfelt and filled with simple joys. The children’s stockings are stuffed with peppermint candy cane, a tin cup (because the children had to share from the same cup before this), a heart shaped cake sprinkled with white sugar and a shining penny, wedged into the toe of the stocking. Their requirements are so simple and the children are so grateful. It is a wonderful reminder to me, that receiving a lot does not always equal greater happiness. They had never even thought of such a thing as having a penny.Think of having a whole penny for your very own. Think of having a cup and a cake and a stick of candy and a penny. There never had been such a Christmas. Which books are your favourite Christmas time reads? I like to read a little Miss Read, this time of year and of course there is always the quintessential ‘A Christmas Carol’. For a look at my Holiday Booklist for the Booklovers in your life please click here. I wish you all a peaceful and very happy holiday season! Main Characters: Miss Rumphius. Miss Rumphius’s grandfather, Miss Rumphius’s great niece Alice. “What is that?” asked Alice? Though Alice paid heed to her grandfather’s advice she did not know what she could do to make the world more beautiful. Miss Rumphius gradually grew up to be a young woman. She worked in a library in a big city, helping people to find books. The library contained books that spoke of faraway places. But she was impatient to see the world with her own eyes. Miss Rumphius travelled far and wide: she climbed to the top of snow-clad mountains, to tropical isles, though jungles and across deserts. Finally she arrived at the land of the Lotus-Eaters and it was here that Miss Rumphius hurt her back while dismounting from a camel. Miss Rumphius decided that she had travelled enough and that it was time for her to find a place to live beside the sea. Miss Rumphius found herself a house by the sea. From her porch she could see the sun rising and setting in all its glory. Beside the rocky ground in her garden, Miss Rumphius planted some flower seeds. But she realized she still had one task to complete in her life: that of making the world more beautiful. That spring Miss Rumphius, who was growing older was taken quite ill. From her bedroom window, she could look upon the cheery sight of the lupines she had planted in the previous summer. Miss Rumphius made a note to herself to plant more lupines that summer but her health prevented it. The next spring Miss Rumphius was recovered but she regretted the fact that she had not been able to plant lupines the previous summer. While Miss Rumphius was walking she discovered with great joy a patch of lupines that were growing in a spot a little distance away from her house. Miss Rumphius realized that the birds and wind must have carried the seeds to a distant place and planted them. It was then that Miss Rumphius had the wonderful idea of planting lupine seeds far and wide across the neighbouring countryside that summer. The next spring there were lupines growing everywhere and their cheery sight made all the people so very happy to see them. At long last Miss Rumphius had complete the third and most difficult task of all. Little Alice, Miss Rumphius’s niece was also inspired to travel to far away places like her great-aunt and also live by the sea. Needless to say that Miss Rumphius advised her that she must also do a third and very important thing…but little Alice does not know yet how she will fulfill this task. Notes: This story with its gorgeous acrylic painted illustrations and sweet story line with an important moral are a joy to behold for children and adults alike. I will let the illustrations speak for themselves! Excerpt: This is the heartwarming tale of a young motherless girl called Emily who has recently lost her beloved father. Emily’s mother’s side of the family draw lots to decide who will have the responsibility of taking care of the young child. Emily goes to stay with her strict Aunt Elizabeth, loving Aunt Laura and friendly Cousin Jimmy at the idyllic location of New Moon Farm on Prince Edward Island. Despite her immense sense of loss, Emily draws comfort from her beautiful surroundings, the friendships she makes at every turn and ultimately her new family. Published: 1923 by McClelland and Stewart, later published by Virago Press, 2013. Location of the story: Prince Edward Island, Canada. Main Characters: Emily Starr, Aunt Elizabeth, Aunt Laura, Cousin Jimmy, Teddy, Ilse, Perry. Thirty years after I had read the Anne of Green Gables series I picked up Emily of New Moon by L.M. Montgomery. When I shared that I would be reading this book on social media, many people told me how much I would love the book. I must admit my thoughts were laced with a great deal of doubt. Would an author who had beguiled me in childhood be able to exert the same power over me in my maturity? I can only answer in the affirmative. Undoubtably so. The story opens with the revelation that Emily Starr’s father is dying and has but a few days to live. We witness the heart wrenching sequence, where motherless Emily is cruelly introduced to this fact via a woman who is a domestic help to the small family. Emily, a highly imaginative child, finds the luminous, magical world she has created for herself, crumbling before her eyes. Her consumptive father, her one and only mainstay in life, is being taken away from her and she has no-one else, in the whole wide world to call her own, except for her cats. To add to the heartbreak, Emily’s maternal relatives, the Murrays, people who have shunned her father during his lifetime are charged with looking after the orphan. They do this willingly, as part of their duty towards their long-gone sister, Emily’s mother. The relatives assemble at the Starr house after Douglas Starr’s death, to draw lots and decide who the responsibility of bringing up the child will fall to. Strict Aunt Elizabeth, sweet Aunt Laura and funny Cousin Jimmy bring Emily home to New Moon Farm, on the other side of Prince Edward Island. Emily’s great grief at losing her father is relieved by a number of factors. One of these are the lengthy letters that she secretly writes to her father. These letters help her to connect with him, allay her loneliness and also allow her to heal via the act of creative writing. Emily’s grief is also alleviated by the joy she finds in the natural beauty surrounding New Moon Farm. She finds joy in the trees, the flowers and the beauty of New Moon’s surroundings. When Emily sees an object of great beauty or is moved by a vision or a scene, she experiences a moment of great ecstasy, that moves her to write. …And always when the flash came to her, Emily felt that life was a wonderful, mysterious thing of persistent beauty. Emily is also enraptured with Cousin Jimmy’s beautiful garden. Cousin Jimmy provides Emily with companionship and a shared love for poetry. Due to an unfortunate accident that occurred during Cousin Jimmy’s childhood, that caused irreparable damage to his head, the folk around New Moon Farm are of the opinion that Cousin Jimmy is ‘not all there’. As for Cousin Jimmy, he was nice. Whatever part of him was missing, it wasn’t his heart. Emily forges a great many friendships. There is the tomboy Ilse who lives next door. Emily and Ilse are constantly sparring but despite this fact, their bond of friendship is very strong. Emily, motivates motherless, undisciplined Ilse to attend school. Emily also befriends artistic Teddy and helps him to emerge from his possessive mother’s shadow. But most of all, Emily influences, farmhand Perry. Perry tries to learn etiquette and manners and strives to do well at his lessons at school. Outside of Emily’s close knit circle of friends is kind Aunt Laura. In Aunt Laura’s affection, Emily tries to find the mother that she never knew. Emily of New Moon, the first book in the Emily Starr trilogy, introduces us to Emily, shows us how she adjusts to the new environment of New Moon Farm, how she makes innumerable, meaningful relationships with the people around her and how she constantly seeks solace for the loss of her father though writing. Emily’s character, like that of Anne Shirley’s, is laced with faults. We witness her getting into various scrapes but we also see that she is conscientious enough to try to redeem herself in the situation, which makes her character eminently likable. One cannot help but draw comparisons between Anne of Green Gables and Emily of New Moon. Both books are set in Montgomery’s native Prince Edward Island. Both Anne and Emily are orphans who feel unwanted in their future homes, at least initially. Both Anne and Emily find people in the household who are kind and sympathetic to their emotional needs. Anne finds Matthew, Emily finds Aunt Laura and Cousin Jimmy. Both girls forge close friendships; Anne with Diana Barry, Emily with Ilse. Both girls have potential future suitors. Anne and Emily both have a hard time with their teachers in school. Both girls are highly imaginative, with a love for reading and writing. I must say that I feel Emily gets into fewer scrapes than Anne! Even though there are undeniable parallels, the story for Emily of New Moon was interesting enough to claim my attention. The writing was especially poignant at times. The death of Emily’s father and her letters to her father are instilled with such pathos that one cannot but weep along with Emily, for her loss and how alone she is in the world. One can take heart though from Emily’s indomitable spirit and her ability to forge friendships and find beauty in her surroundings. Montgomery has yet again presented to us a passionate, willful young woman with a tragic past, eventful present and promising future. Short Synopsis of the Story: This is the story of the transformation of a little egg, to a caterpillar, a fat caterpillar, a cocoon and finally a beautiful butterfly. The story starts with our observing a tiny speck of an egg glistening on a leaf in the moonlight. The next morning, which happens to be a Sunday, the sun comes up and the little egg hatches into a tiny caterpillar. 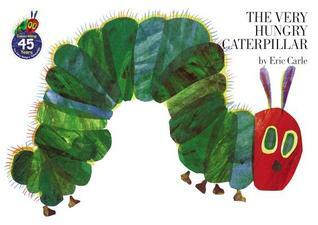 The caterpillar is very hungry and each day of the week it eats something different. On Monday it eats one apple, on Tuesday it eats two pears and so on until by the end of the week it has grown into a very fat green caterpillar. In the next stage of the caterpillar’s life we notice its transformation into a cocoon where it lies for two weeks until its final emergence as a beautiful butterfly. Notes: This was one of the first board books I bought for my baby daughter. The illustrations are brightly colored and very attractive. Apart from learning about the amazing transformation of an organism, the book teaches us about different fruits and food, the numbers and the days of the week amongst other things. The best thing about the book are the little holes built into the fruits and foods that the hungry caterpillar nibbles through. The book is a wonderful tactile as well as visual aid for children. This is a classic book to be read again and again. Main Characters: ‘Sam I am’, unnamed character (also the first person narrator). Short Synopsis of the Story: This is a story told completely in repetitive rhyming verse in the nonsensical style typical of Dr Seuss’s storytelling. 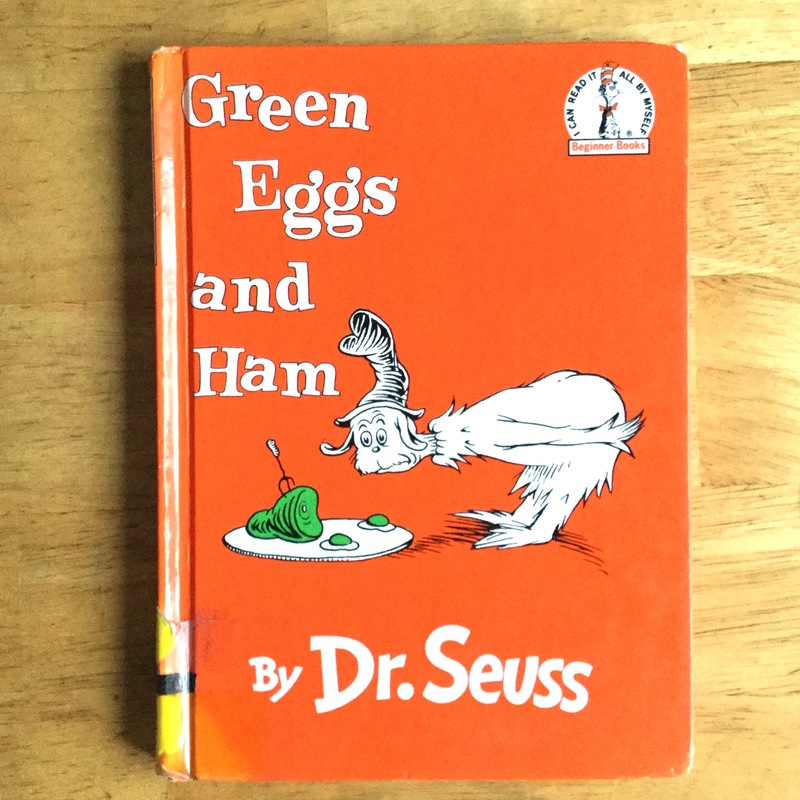 In the story, the narrator is encouraged by ‘Sam I Am’ in multitudinous ways to partake of a meal of green eggs and ham. To further tempt the narrator, Sam-I-am offers the narrator a choice of locations for eating the green eggs and ham. The locations range from in a house with a mouse, to in a box with a fox, to in a car or a tree or even a train. In all the instances the narrator declines the offer of green eggs and ham to be eaten in those locations. But Sam-I-am persists. Perhaps the narrator would eat green eggs and ham in the dark, or in the rain, or perhaps in the company of a goat or on a boat? Alas, in all the offered situations, the meal of green eggs and ham is again declined. To this entreaty what can the narrator do, but comply? And to his great satisfaction finds … that he does indeed like green eggs and ham! Notes: The tale is told in repetitive rhyming verse and is remarkably composed of a mere fifty word vocabulary. That Dr. Seuss can construct an enjoyable story with such an economy of words is worthy of high praise. The limited vocabulary and the repetition of words makes this an ideal book to encourage children to read by themselves. It is quite enjoyable to read and follow the pictures and verse and the rhyme is quite addictive. What is the moral of the story you ask? Perhaps, it is written to encourage people to try something out before they completely say no to it. But green eggs and ham? Now what is that?